Pa. registration tags should make a comeback, state lawmaker says. 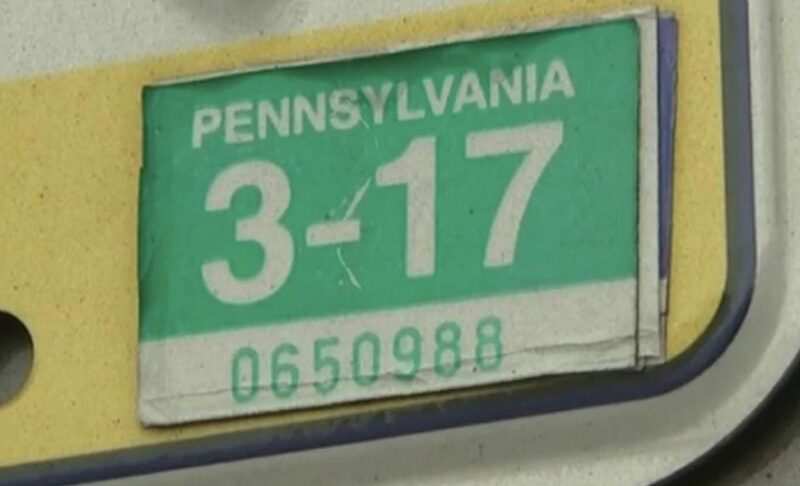 (Harrisburg) — A Pennsylvania state representative is pushing for a new type of stickers to prove current vehicle registrations. Under Rep. Barry Jozwiak’s plan, annual safety inspections and registration would become a two-step process, resulting in a single, two-purpose sticker to be affixed to license plates, just like the old days. Emissions check stickers would stay as they are. “I think it’s a public safety issue to be honest with you,” said Jozwiak, a career state trooper and former Berks County sheriff. It would lead, Jozwiak believes, to safer streets and highways across Pennsylvania. Because Jozwiak is of the belief that PennDOT’s 2016 modernization effort that rendered the iconic license plate sticker extent has resulted in an uptick in scofflaws who — for whatever reason — are skipping the registration process. He rests his case on a rare one-year dip in statewide vehicle registration numbers in 2017, the same year that the old stickers were phased out. According to PennDOT reports, registrations dropped from 12.07 million at the end of 2016 to 11.83 million in 2017. That’s after year-over-year growth in total registrations every year in this century. The numbers did start to bounce back in 2018, to 12.04 million. But it still leaves Jozwiak suspicious that the number of unregistered – and potentially uninspected and uninsured – vehicles is on the rise. Here’s the problems he’s identified. First, he believes that if more motorists are driving bare, that is robbing the state’s motor license fund of $20 million per year or more, by his estimates. That’s important for a department that is constantly saying it needs more money. There are also public safety implications. Without the physical tags on the back ends of our vehicles, Jozwiak believes, local police officers are missing out on one easily visible identifier of potential violations. Here, Pennsylvania State Police numbers provide some interesting context – if not necessarily clarity. From a baseline of 25,416 registration citations in 2016, violations have actually jumped to 31,337 in 2017, and 44,502 last year. PSP spokesman Ryan Tarkowski said troopers are all equipped with on-board equipment that allows them to check license plates for registrations directly with PennDOT’s databases. In some ways that’s better than stickers, Tarkowski said, since stickers can be switched from vehicle to vehicle. But Jozwiak counters that the rise in citations may also prove his point, that more drivers are avoiding the law. And finally, he says that he’s also been made aware of Pennsylvania motorists with old or no stickers being pulled over during out-of-state trips by officers who expect Pennsylvania vehicles to have current stickers on their license plates and don’t know of the switch. Supporters of PennDOT’s registration change said then that the need for visual indications that a vehicle is registered no longer exists, thanks to technological advances. Additionally, the move was expected to save the state $3 million annually between the cost of producing the stickers and mailing them out to drivers. The moves also coincided with the launch of a two-year registration option, but Jozwiak doesn’t think that latter change should account for the 2017 drop in total registrations. PennDOT, for the time being, is standing by its current program. “Since implementing this modernization initiative customer feedback across the state has been very positive,” department spokeswoman Melanie Baldwin told PennLive Tuesday. “Customers like the convenience of being able to print their registration card when renewing on the website. They like not having to place the little sticker on the license plate especially when the weather is bad. Trucking companies in particular like the program since in the past when a vehicle was renewed it may be across the country creating logistics issues with getting the sticker to the location of the truck. That inconvenience no longer exist. “Customers have been clear they like the elimination of the registration stickler and the convenience it has allowed,” Baldwin said. The state’s largest motorists’ group says its focus in the current legislative session is on reducing distracted and impaired driving and making failure to use seatbelts a primary offense. Ted Leonard of the Pennsylvania Federation of AAA said his office has some sympathy with Jozwiak’s concerns, but believes the traffic safety issues are a higher need right now. Jozwiak, however, says his concept just needs a chance to sell itself. Combination stickers are being used now in North Carolina and Texas, he said, and the results have been good. Jozwiak’s bill hasn’t been formally introduced yet. That will come later this month, he says, after he gets a chance to present the outline of the proposal to members of the General Assembly’s law enforcement caucus.